Happy Friday!! We're excited to share another amazing family with you today. These guys are truly special to us because we actually photographed Ashley + Mike's wedding 5 years ago! These guys came to Vegas from Central California and tied the knot at Caesar's Palace. I remember it being such a fun wedding and I can't believe it's been 5 years already! You can image how thrilled I was when Ashely contacted me and told me they'd be in town celebrating their 5th year wedding anniversary last month and wanted to get some family portraits done with their 2 little ones! She knew she wanted to go back to Nelson, NV where we photographed their wedding day-after session! 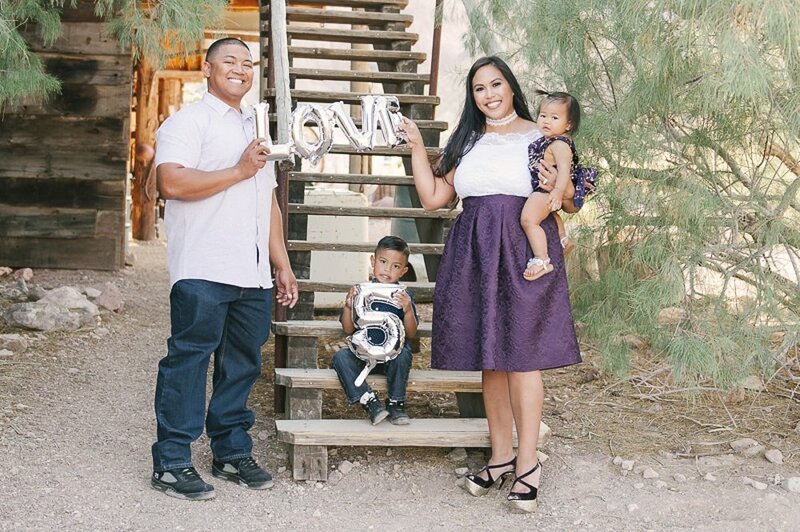 I also loved how Ashley incorporated a bit of their wedding day into their family shoot, by choosing the same purple color scheme from her wedding and they even wore the same shoes, plus this time their little guy wore matching shoes like Daddy! It was seriously such a treat to see and photograph Ashley and Mike and now with their little ones!!! Happy Anniversary, Ashley + Mike and congrats again on your beautiful family! Interested in having Jessie photograph your beautiful family? just drop us a line HERE and we'll get started!